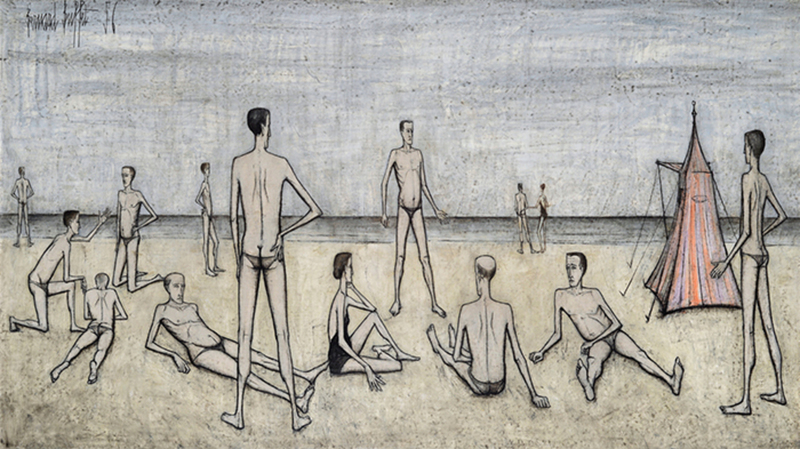 Bernard Buffet, La plage, 1956, oil on canvas, 44 7/8 × 76 3/4". Two admissions are needed to make the case for Bernard Buffet, a painter so long considered minor that his work isor wasunredeemable even in the realm of camp taste: First, one must accept that painting is a serious vehicle for artistic expression; second, one must admit that anything sufficiently seen eventually comes to sit normatively in the eye. My 1950s triangulated between New York, Chicago, and Paris, so I well remember Buffet as a central figure amid a group of artists called Misérablistesthe now-forgotten Francis Gruber being the other once well-regarded painter of the crew.